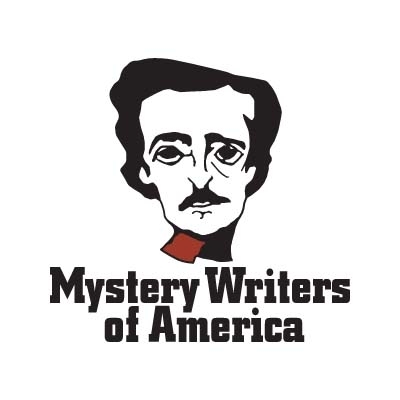 The Edgar Award is an annual award presented by the Mystery Writers of America and is widely perceived as the most prestigious award that can be won by a writer. 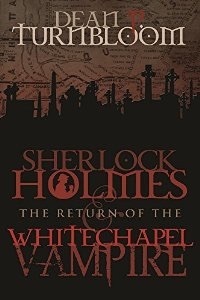 This year I’ve submitted “Sherlock Holmes and the Return of the Whitechapel Vampire” for an award in the Original ebook/paperbook category. Obviously the competition is incredible, take a gander at the page on which my submission is documented. Just select the “Best Paperback/E-book Original” category and then scroll down to find my name and book title. Even if I don’t win, it’s pretty cool to even have been submitted my publisher, MX Publishing. The nominations will be announced around the birthday of Edgar Allen Poe, January 19, 2016. The winners will be announced at the annual Edgar Awards Banquet, on April 28, 2016. I will be ecstatic if I just get a nomination. Sherlock Holmes is now a country squire who has retired to Sussex to tend to his bees and write monographs. He hadn’t written to his friend Dr. Watson in a few months, so when the post brings news from Holmes, Watson is pleasantly surprised. But Holmes has more than a few banalities to tell his old comrade: bodies have been surfacing near the coast of Newfoundland, drained of blood, but there’s no trace of a shipwreck. 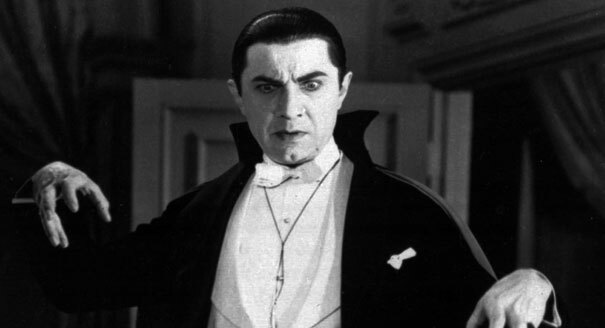 Holmes fears their old nemesis, Baron Barlucci, after laying low for over two decades, is up to no good again. Barlucci is a painful thorn in Holmes’ side. The Baron is the only villain the great detective hasn’t captured, and of course, Dr. Watson must sail with Holmes to Manhattan Island, where more bodies have been found. 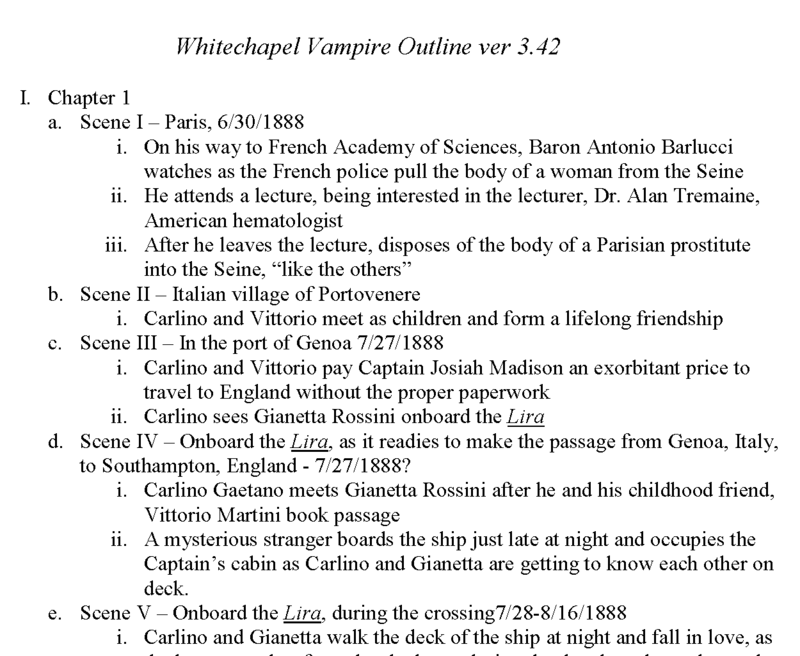 SHERLOCK HOLMES AND THE RETURN OF THE WHITECHAPEL VAMPIRE is not the pastiche I thought it might have been, but the almost real deal. Right from the opening paragraphs, I was overjoyed because I felt I was reading a brand new Conan Doyle mystery. 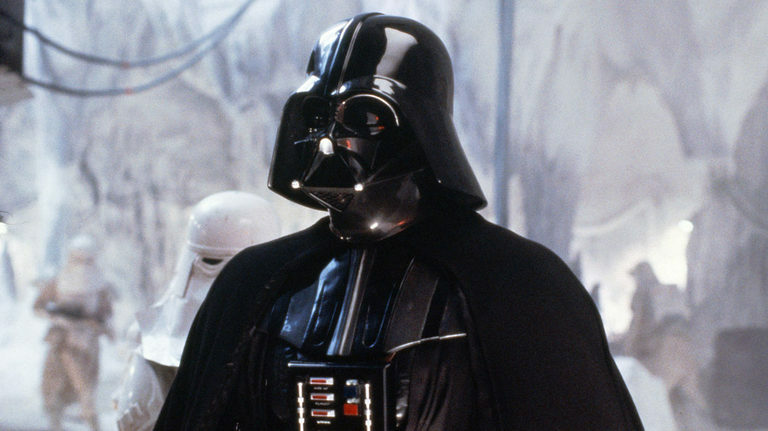 Being a die-hard fan of the original, I then became wary: could a modern author be successful in this tremendous undertaking? The answer is a resounding yes! SHERLOCK HOLMES AND THE RETURN OF THE WHITECHAPEL VAMPIRE is more than an homage to Conan Doyle: Mr. Turnbloom essentially captures everything that is Sherlock Holmes and Dr. Watson but makes it his own, without the reader ever having the impression of the author “trying”; never does the author endeavour to copy, but he in fact prolongs the formidable legacy of Conan Doyle. Mr. Turnbloom’s writing is eloquent and vivid, he captures the early twentieth century as accurately as a photograph, the tone is impeccable, the dialogues and the banter are entirely evocative of Conan Doyle’s, and Holmes and Watson are exactly how they should be. The pacing is perfect, and the story is as gripping as any Sherlock Holmes book. 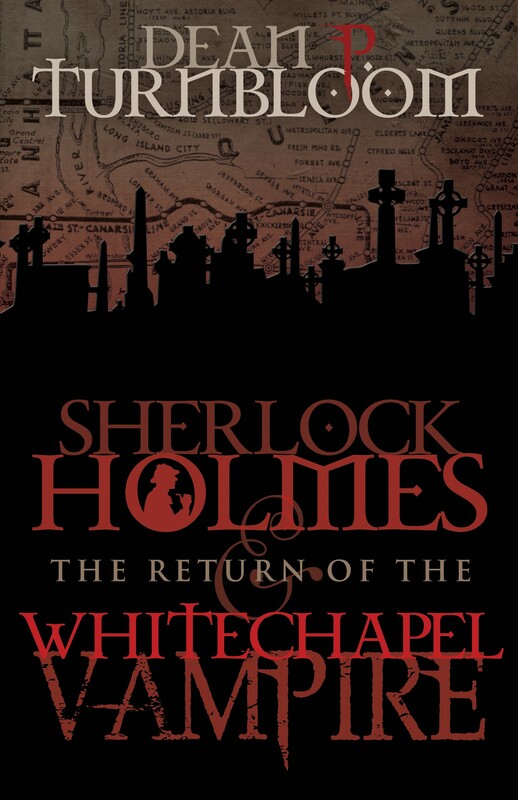 If I have one regret it’s not knowing that SHERLOCK HOLMES AND THE RETURN OF THE WHITECHAPEL VAMPIRE was the third book in this series, and while obviously this instalment can be read as a standalone, the previous books figure now on my to-be-read-pile because it is simply brilliant. SHERLOCK HOLMES AND THE RETURN OF THE WHITECHAPEL VAMPIRE is absolutely splendid from beginning to end, and should be read by anyone who hasn’t had enough of Sir Arthur’s great detective, and everybody who likes a good mystery! So I went to the post office today to send out the copies to the Goodreads winners. One of the winners is in Australia and the postage was more than the book costs. I hope the winner enjoys it. Thanks to everyone who entered the Goodreads Giveaway for my latest novel, “Sherlock Holmes and the Return of the Whitechapel Vampire”. Over 2100 people entered and I will be mailing out the winners’ autographed copies tomorrow. Congratulations SAMANTHA and MARIE!! Don’t forget to write a review as soon as you have read the books! The invitation goes for anyone who has read my work to review it — either on Goodreads or on Amazon and/or Barnes & Noble. Although I’m not certain what the source was, I created this handy-dandy little checklist for comma usage early on in my writing career. I still use it from time to time, although more a gentle reminder than as a check_list. I hope you will find it useful too. As an aid in using this checklist, I’m also including definitions of some of the terms used above. No offense implied should you already be familiar. Restrictive and non-restrictive clauses: An adjective clause is restrictive when it limits the thing it refers to and is therefore essential to the sentence. Example: The store accepted returns that were less than sixty days old. If an adjective clause adds non-essential or extra information it is non-restrictive and should use a comma followed by which to introduce it. Example: Julia’s scarf, which was purchased three months ago, was not accepted as a return. Introductory dependent clause: A group of words including a verb and a subject but does not express a complete thought and cannot stand alone, which introduces a sentence. Example: When I worry, I eat. Example of non-restrictive clause in the middle of a sentence: The book, which was on the table, was on fire. Appositive: A noun or noun phrase that renames another noun right beside it. Example: His hat, a billycock, was askew. His girlfriend, a short girl with flaming red hair, sat down beside him. Parentheticals: A parenthetical is a statement or reference that is incidental and could be properly enclosed within parentheses (hence the name). Example: Parentheticals, for example, require commas. Transitionals: Words and phrases used to connect one idea with the next. Example: The fingertips contain numerous nerve endings. To illustrate, pick up that branding iron. Conjunction: A word used to connect clauses or sentences or to coordinate words in the same clause. Example: In his pocket he had a coin, a ring, and a piece of twine. Independent clause: A clause (group of words consisting of at least a noun and a verb) that can stand alone as a simple sentence. Example: His car started smoothly and he took off for home. 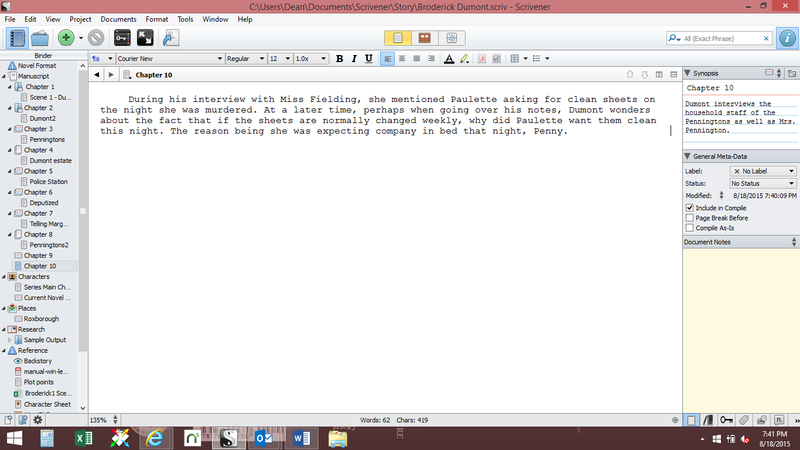 Because I am not the most methodical of creatures, I often struggle with organization when writing a novel. I’ve used outlines, pictographs, spreadsheets, and mind maps. None of these has been completely satisfactory to me. So, I thought I would offer up to anyone interested in writing, some of the ways I’ve combined the usage of a few of these methods. But this two was overly cumbersome when scenes or chapters needed to be rearranged. Then I discovered an inexpensive program that helps deal with these details. Again, I have to thank Jane Friedman for introducing me to it. It’s called Scribner, and here is a screen shot of it that shows some of the features. What I like best about it is that I can take entire scenes or chapters and move them around at will. Also, if you are using it to actually write your work, its intended use, you can capture references, web sites, pictures, other files, etc., and have instant access to them from within the program. This is a colossal time saver, especially in the beginning when you are doing a lot of research. Recently I read an article saying scientists last year published data that the universe is dying. Don’t panic, apparently it’s been dying for the last 10 billion years and will continue to die for trillions more. So this isn’t the news that grabbed my attention. 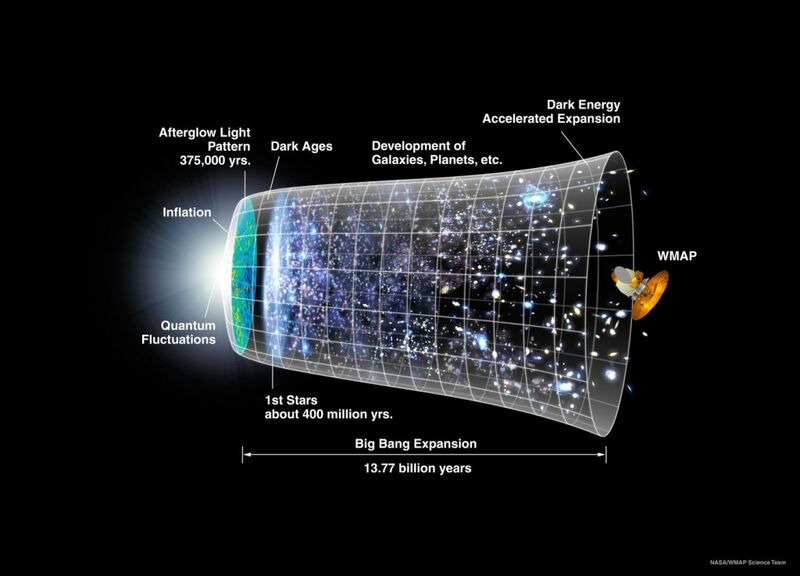 What I found more fascinating than a dying universe was the postulation that dark energy was causing the expansion of this dying universe to speed up. And that dark matter is a substance that keeps our own galaxy from flying apart. These ideas seem to me to be counter-intuitive, but then they were predicted by no less an Einstein than Einstein, so who am I to doubt? Anyway, this got me thinking about how in almost every culture, every genre, every folk tale, darkness is equated with evil. And then to find out that dark energy is speeding up the demise of the universe is to me, quite shocking and a bit revelatory. I mean, it tends to imply that we have an innate sense of the universe and the place of darkness within it. 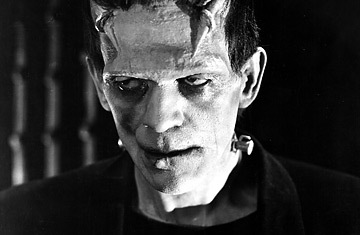 So, rather than saying that evil is negative energy, perhaps it’s more accurate to say that evil is possessed of dark energy. This gives thought perhaps to having an evil genius or race of aliens who use dark energy in ways we use (should we call it) light energy, with the theme of Good vs Evil becoming an actual battle between darkness and light for the very life of the universe.